J.M. Robson proved that GO is EXP-time hard by reducing any instance of a certain EXP-time complete problem to a GO position involving a capturing race. 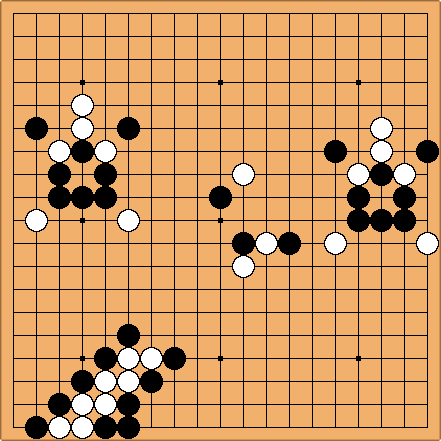 In the following you will see how the reduction is done using ladders instead -- this (aesthetic at least) improvement on Robson proof was part of a master thesis "PSPACE vs EXP-time and the game of Go" by "erasmarum". Consider the following problem: White to move, can she save her bottom group? 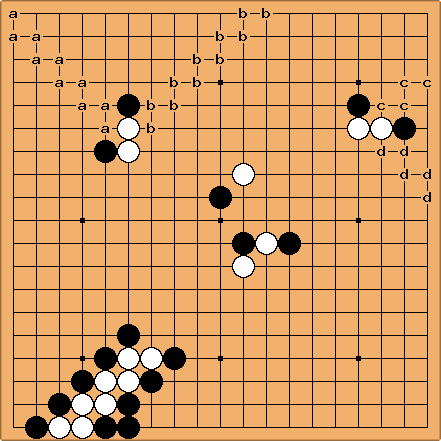 It is relatively easy to see that the only move that makes the group alive is to capture the upper KO. 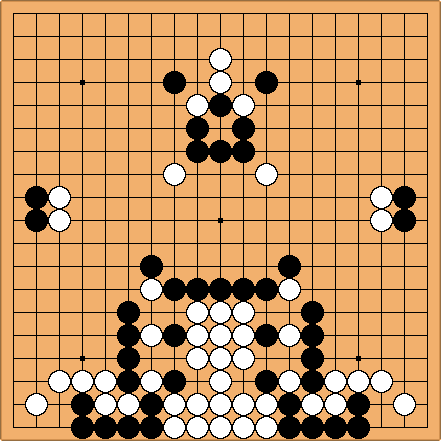 This move will make either the left l ladder or the right r ladder to work for White. Moreover, there is no local KO threat for White nor for Black due to shortage of liberties of some groups. We can see that the ladder coming from the lower left corner either turns to left if Blacks plays a or continues in the same direction if Black plays b. Thus the ladder will work for White if and only if the left KO AND the right KO are won by White. 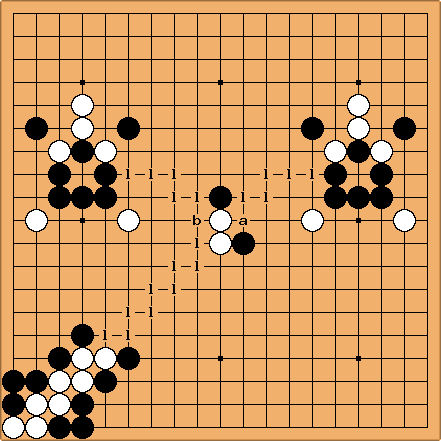 The above ladder works for White only if the left KO OR the right KO is won by White. The above ladder has 4 possible paths: a,b,c,d. You can see that the ladder works for White if (a path works AND b path works) OR (c path works AND d path works). add path changing configurations on the left side to make the ladder connect all KO gadgets -- that is, the left ladder will have n possible paths: l1 to K1, l2 to K2, etc. keep the position symmetric by mirroring the left path changing configurations on the right ladder. White is alive if she can play a sequence k_i1, k_i2, ... of KOs that forces Black to respond on say k_j1, k_j2, ... KOs and she can drive the left ladder to a won ko no matter what Black plays. the "board" of the game is a certain positive Boolean formula F over the K1,..., Kn variables. White wins if she is to move and the current assignment makes formula F true. See "Exponential time decision problems relating to KO-like transition rules" for more details.